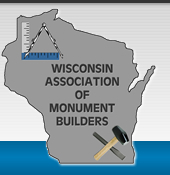 Being a member of the Wisconsin Association of Monument Builders is an excellent testimony to your dedication to the industry. If you are looking for a company that will stay on top of the current trends, you have come to the right place. The members listed below has proven they are invested in knowing the latest trends and techniques to make your experience as comfortable and knowledgeable as possible. Are YOU a member? If you are already a member and would like to update your contact information or need changes made, please contact our secretary Aaron Miller at . Not a member, but would like to feature your business here? Find out about our membership options by contacting our treasurer Tim Haskins at . We strongly recommend both our Members and Associate Members to please patronize the following businesses and tell them you found them at WAMB. Just scroll through our members list below by Wisconsin county.